The Caspar Community's enthusiasm for Halloween is well known on the North Coast, and this year, with Pumpkin Day falling on a weekend, the celebration is being extended into two days of events. Things kick off Saturday, October 30th with a Halloween dance and costume party, then continue Sunday with a carnival for children, and the traditional Halloween Parade featuring Gertie the Gorse Monster. Later that evening everyone is invited to a potluck dinner and an evening of weird and scary movies. All events will take place in and around the Caspar Community Center. The Saturday night dance begins at 8:00 pm, and will feature the sweltering Latin grooves of ¡Mambo This! The evening's entertainment will also include a fiery performance of Haitian music by The Crossroads Drum and Dance Troupe. The evening also gives participants the chance to win a hefty cash prize, which will be awarded for the most creative, wackiest costume. Paul Schulman, who is both a member of both ¡Mambo This! and the Caspar Community's board of directors, is expecting an exciting competition. "We are offering a cash prize of $100. We figure that should inspire some serious costume creativity." Light refreshments, beer, and wine will be available. The event is a benefit for the Caspar Community Center. Tickets are $10 at the door, half price for students and children get in free. 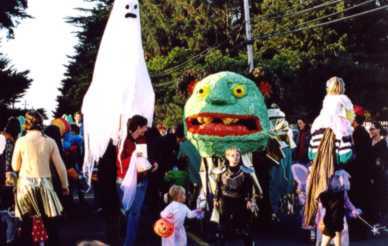 But the real events for children start on Sunday, October 31, when the Caspar Children's Garden and the Mendocino Satellite School sponsor a Halloween Carnival at the Community Center. Festivities start at 2:00 pm and continue until 4:30. Kids are encouraged to come in costume, and they will find a room full of fun, including games, face painting, fake tattoos, a glow jewelry booth, pizza, a cake walk, and a bake sale. Dalen Anderson, director of the Caspar Community Center, has arranged for the steel band, Kevin and the Coconuts to play starting at 4:00 pm. This will get everyone in the mood for Caspar's traditional Halloween Parade, which will begin at 4:30 with the appearance of Gertie, the giant twenty-foot-long Caspar mascot. Everyone present is encouraged to follow the Gorse Monster as she parades down Caspar Road and back again, so kids don't just watch the parade, they get to be in it. In past years a large number of adults have shown up too, and everyone follows Gertie as the steel band plays! After the parade the Caspar Community will hold an informal potluck dinner to which everyone is welcomed. That will be followed by an evening of scary movies. This will be the first use of a projection video system that has just been installed at the Caspar Community Center. For more information about the children's carnival, call 961-0239. Information on the rest of the weekend's activities can be had by dialing 964-4997. In case of rain the parade will be cancelled, but all other events will go on as planned.